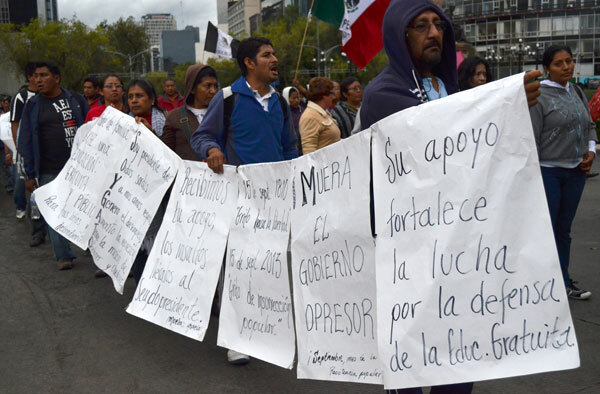 The Teachers Union of Oaxaca has been camping out in the main square of Mexico City, the Zócalo, in protest of the new education reform implemented by President Peña-Nieto. The teachers, who have been protesting for almost a month, have denounced the reform saying it chips away their labor rights, fails to recognize the diverse needs of students in rural indigenous communities, and paves the way for school privatization. 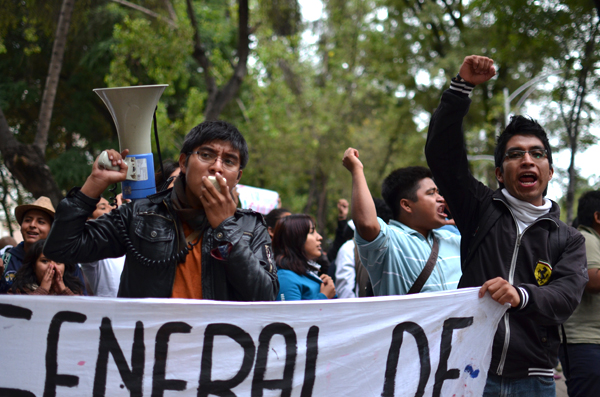 Teachers from Chiapas, Michoacán, and Veracruz have joined them in the capital. 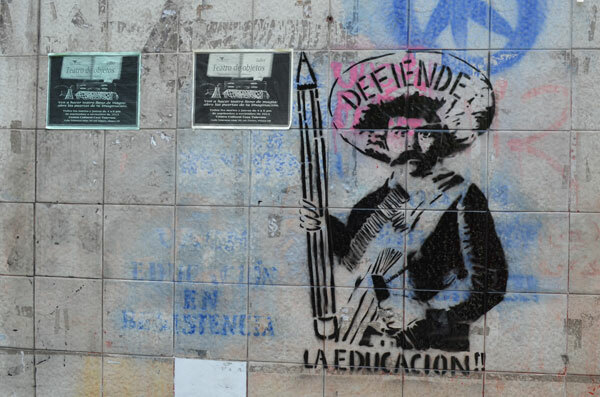 The Teachers Union of Oaxaca has been camping out in the main square of Mexico City, the Zócalo, in protest of the new education reform implemented by President Peña-Nieto. The teachers, who have been protesting for almost a month, have denounced the reform saying it chips away their labor rights, fails to recognize the diverse needs of students in rural indigenous communities, and paves the way for school privatization. 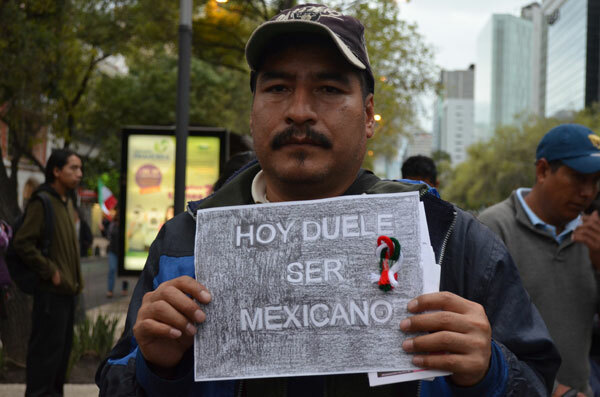 Teachers from Chiapas, Michoacán, and Veracruz have joined them in the capital. Additionally, teachers in 27 states across the country have risen up in protest. 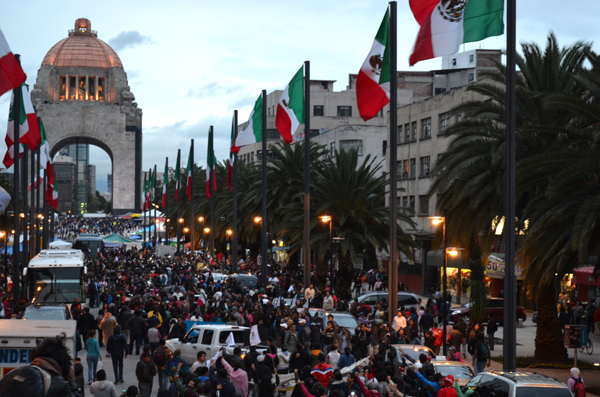 On September 13th, the Mexican government announced it would clear the Zócalo in preparation of the Independence Day celebration, which would follow two days later. 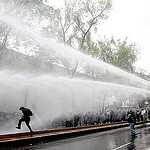 The teachers union refused to leave, and the government responded with the brute force of 3,600 police who used, tear gas, a water cannon tank, and Black Hawk helicopters to evict them. 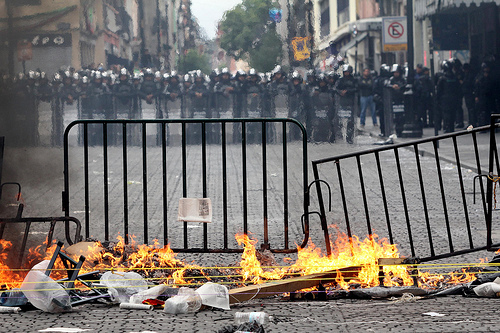 There were over 30 arrests, many teachers wounded, and thousands forced to fled the Zócalo without their belongings. Eventually, many teachers ended up at the Monument of the Revolution where they set up a new encampment. 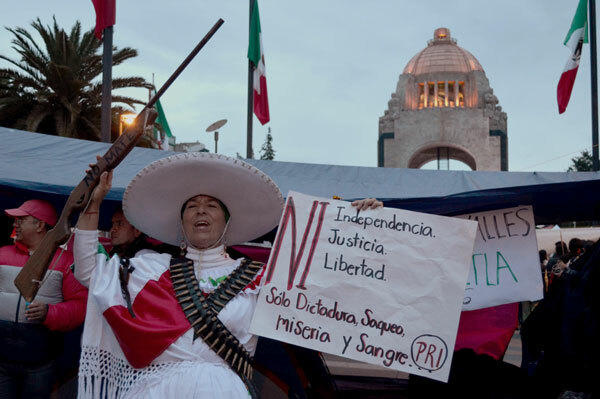 Two days later, on Mexican Independence day, close to 10,000 people including teachers, students and members of civil society mobilized in support of the teachers union and to denounce the repression. 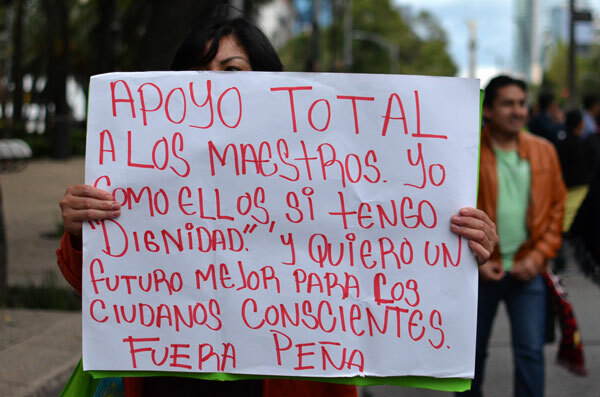 In the middle of night, Friday the 13th, Police forces evicted the teachers’ protest in Xalapa, Veracruz and two independent journalists and environmental activists were arrested. 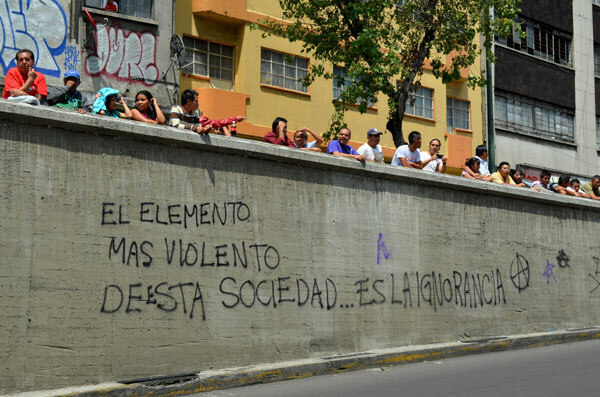 In this sign, protestors in Mexico City question what the Commission of Human Rights is doing regarding the wounded and unaccounted for from the eviction in the capital and in Xalapa. 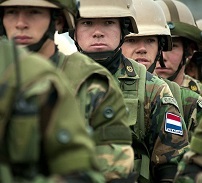 Traditionally Mexicans shout “El Grito” to commemorate Mexico’s independence from Spain. 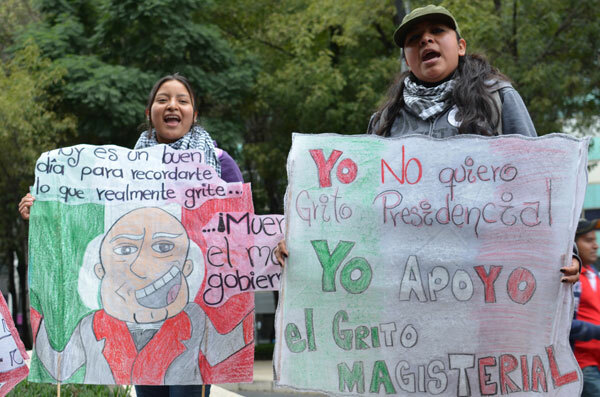 Many protestors expressed their conflicted views about shouting the “grito” of independence in celebration. “In many of the previous marches organized by the teachers, there were few members of civil society who participated. In this march there were diverse contingents of students and civil society and in these signs the teachers thank people for their support of the struggle. 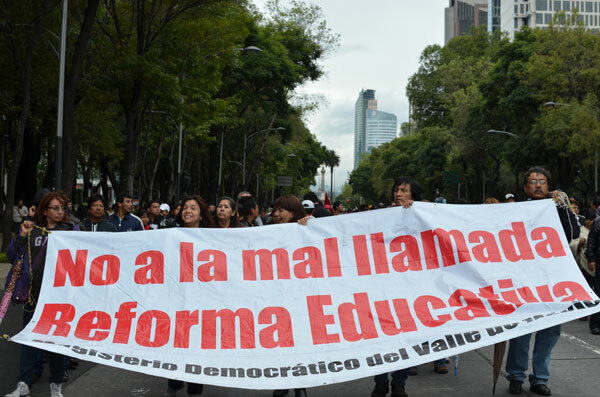 “Say No to the wrongly named Education Reform.” Many teachers have criticized the education reforms, saying that they do nothing to improve education and should be aptly called labor reforms. 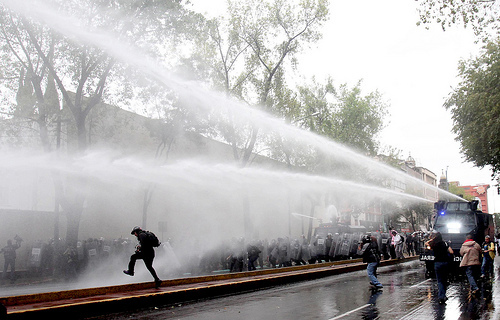 After being evicted from the Zócalo the teachers set up camp a mile away at the Monument of the Revolution. 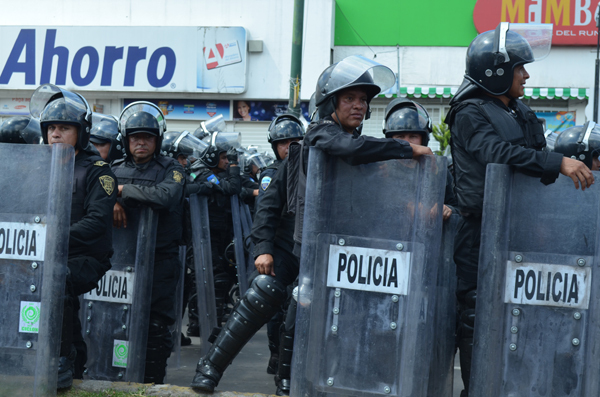 Riot Police have been a constant at many of the mobilizations of the teachers. This photo was taken at a large teachers mobilization in protest of the State of the Union address on September 1st, minutes before police arrested 16 activists, including 4 independent journalists. 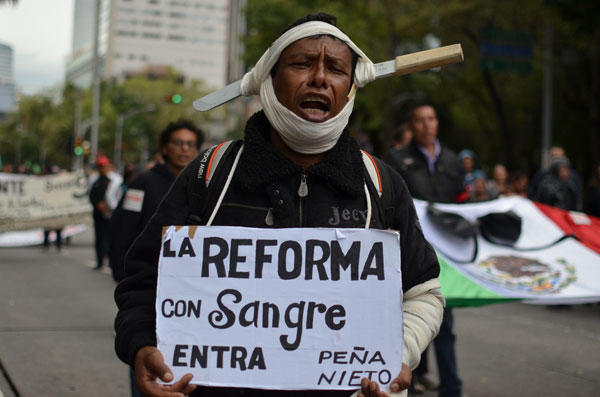 Many have criticized Peña-Nieto for further opening Mexico to foreign investment. 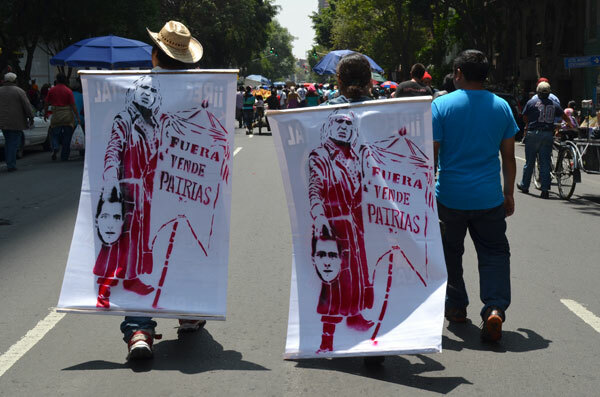 In these banners, Hidalgo, the Mexican champion of independence has kicked out the “traitor” Peña-Nieto. Andalusia Knoll is a multimedia journalist based in Mexico City. She is a frequent contributor to Free Speech Radio News, Truthout and The Real News Network and collaborates with various independent media collectives throughout Mexico including Subversiones. You can follow her on Twitter at @andalalucha and view more or her work on her blog.